This rug was purchased for my spare room. It is truly beautiful. I'd give it 5 stars but didn't because it is a thinner rug. I believe it will last being in the spare room though. Very flat rug but I am using it under my dining room table, so I didn't not want a big fluffy rug. The color is pretty and it is subtle enough to not overpower my dining room furniture. 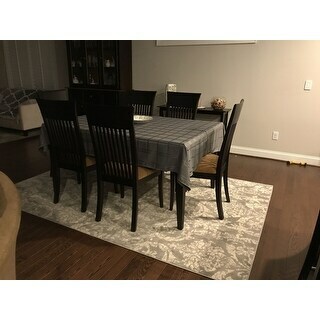 Option: Grey - 5'3" x 7'3"
Purchased this rug in grey. It's surprisingly soft given that it's not a very thick rug. The pattern is beautiful. Very pretty. Muted tone makes it easy to add other colors and patterns in the room and the rug doesn’t clash. I do need to buy a mat or grips for the corners, it’s still not laying flat. Very nice rug-a little lighter and thinner than desired but using it under dining room table so thinner is probably better. Takes about a month for it to completely flatten. This rug is just beautiful! I got the runner size to go in front of my dresser and it looks great. The quality and color (Gray), are truly amazing. The color(silver/gray) was as viewed on line. The quality of the rug was sub par. It is very thin, and the fibers were very thin. I returned it. Still looking for a rug. I like the gray color.......for the price it certainly has done the job. As the master bathroom is quite large with tiles that a so cold, that I used this carpet to cover a large area. It looks really good there. Option: Grey - 7'10" x 9'10"
Looks very pretty in person. Fits in with my decor in the dining room. The color is a bit more cool gray than what it looks like in the picture. But over all very happy with the purchase. Love this rug! Looks great in the office. Great price for its quality. Very pleased with the purchase! Very cheap rug, won’t lay flat from being so tightly rolled. Looks beautiful and is somewhat soft on top though the rug itself is a bit hard. Overall a good product for the price, just wish it was slightly softer. Very pretty And nice quality for the price. "Does this rug shed at all? I can’t deal with ordering another one that does :( Thanks"
This is 100% polypropylene and does not normally shed. Not very thick at all, about a quarter of an inch, good backing and sticking all around. Quite soft surface, I recommend the gray. I actually have it in my bathroom which is tiled and cold in the winter months. Yes, this rug has been described as soft.